Last week I purchased two magazines– the type made of paper—from a bookstore—the type made of bricks and mortar. Radical, I know, but it’s part of my August sabbatical strategy of whacking myself upside the head. 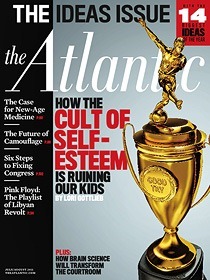 There’s an article in the July/August issue of The Atlantic titled How to Land Your Kid in Therapy by Lori Gottlieb. The tagline: "Obsessing over our children’s happiness may doom them to miserable adulthoods." Something surprising began happening: I started getting more patients like her. Sitting on my couch were other adults in their 20s or early 30s who reported that they, too, suffered from depression and anxiety, had difficulty choosing or committing to a satisfying career path, struggled with relationships, and just generally felt a sense of emptiness or lack of purpose–yet they had little to quibble with about Mom or Dad. Instead, these patients talked about how much they "adored" their parents. Many called their parents their "best friends in the whole world," and they’d say things like "My parents are always there for me." Sometimes these same parents would even be funding their psychotherapy (not to mention their rent and car insurance), which left my patients feeling both guilty and utterly confused. Atlantic video titled, The Trophy Kids: "Lori Gottlieb speaks to parenting expert Wendy Mogel about the ways well-meaning parents can ruin their children." Previous PostMy new blog: Mountain Bike GeezerNext PostSabbatical week #2: What should Northfielders know about or discuss this week? Judging from the piles on my desk, in additon to “SFB” I’m afraid I have “EFD” as well. Somewhere between the ruler carrying Mother Superior in Blues Brothers and the laissez-faire parenting styles we seem to experience in Northfield is that happy medium of discipline and freedom. The bell curve is like gravity … with gravity, you can pretend all you want, but at the end of the day don’t be jumping off buildings with a tablecloth cape thinking that gravity does not apply to you. And the bell curve tells us that half of us are below average. Garrison Keillor mocks us correctly when he says that all the children in Lake Wobegon are above average, and while the average child today may be more intelligent than the average adult (though usually much less educated), the average child is still average for their peer group. Bruce and Griff: do you feel that this “laissez-faire parenting style” mentioned by Bruce and described in the article is actually common in Northfield? I don’t know all the parents, certainly, but I see a lot of people working hard to give their children structure, high standards of behavior, and the tools to live as successful adults. I don’t know if everyone had a chance today to read the “Dilbert” comic strip, but here is a link to it. Be sure to refer to the August 9, 2011 dated strip. I think Scott Adams pretty much summed up one end result of the focus on self esteem. Was talking about something related to this recently. Interesting study results I read a while back; praising children for being “smart” is harmful, praising them for “working hard” isn’t. My parents gave me a ton of room to do things, and for the most part, the net result is that I’m confident and capable of being decisive. The problem isn’t “laissez-faire”, I think, it’s “lack of meaningful feedback”. My parents didn’t pretend I didn’t make mistakes; they just let me make mistakes if I wanted to, for the most part. Good learning experience. AAA, fast maturity, would grow up again. Gosh, Peter! Do you mean it is OK to make a mistake now and then, and then make it right? Personal responsibility is such a bothersome concept.